“Immigration to the United States, 1789-1930, is a web-based collection of selected historical materials from Harvard's libraries, archives, and museums that documents voluntary immigration to the US from the signing of the Constitution to the onset of the Great Depression.” It includes a wide range of materials and includes approximately 1,800 books and pamphlets, 9,000 photographs, 200 maps, and 13,000 pages from manuscript and archival collections. Columbia River Basin Ethnic History Archive (CRBEHA) is a “collaborative project sought to create a database with thematic coherence that would engage online researchers in thinking more deeply about the significance of the rich primary resources available in museums, libraries, and historical societies.” The website makes available the shared collections of Washington State University Vancouver, the Idaho State Historical Society, Oregon Historical Society, Washington State Historical Society, and Washington State University Pullman and features “selected documents, reports, records, maps, photographs, newspapers, artifacts, and oral history interviews” about various ethnic groups in this region. ImmigrationArchive.com, run by NewspaperARCHIVE.com, is a free archive of 50,000 historical newspaper pages and chronicles the history of immigration through newspaper articles. Harvard’s digital archive and the Columbia River Basin Ethnic History Project (CRBEHA) have similar goals in their efforts to combine and digitize an abundance of primary source materials from several repositories, increase access and public use of these archives, and promote further study on the history of immigration. However, the Harvard archive strives to combine materials from repositories only connected to the university while CRBEHA intends to combine sources about immigration from museums, historical societies, and libraries throughout the Northwest. The immigration newspaper archive is very different from the other two websites because its goal is to provide access to only newspaper articles, with an emphasis on immigration policy issues. “Immigration to the United States, 1789-1930” is a web based collection of historical sources about immigration to the United States (1789-1930, concentrating primarily on the 19th century) from various repositories at Harvard. These materials were brought together from Harvard’s libraries, archives and museums to “benefit students and teachers around the world.” The mission of the digital archive is clearly stated on their homepage (http://ocp.hul.harvard.edu/immigration/), which describes the subject of the archive, various themes and the importance of this historical topic, where the materials were gathered from, and the overall scope of the project. One of the goals of the website is to provide “a window into the lives of ordinary immigrants” who have “profoundly influenced the character and growth of the United States.” Through a wide range of materials, the archive strives to cover “diverse experiences.” Although the creators of the project are clear about their intentions, I find it peculiar that they do not specify the various ethnic groups whose histories they make available through archival materials. I will come back to this point in the searchability section. The OCP developed collections must have broad appeal, cover “topics of contemporary concern,” use a wide range of sources, and utilize a number of Harvard repositories. Information about Harvard’s Open Collections Program can be found here http://ocp.hul.harvard.edu/. The Columbia River Basic Ethnic History Project (CRBEHA) is a collaborative project that combines “selected highlights of the ethnic collections” from various museums, libraries, and historical societies in the Columbia River Basin area, particularly from five repositories in Idaho, Oregon, and Washington. • To create a “database with thematic coherence” that would allow researchers to interact and think “more deeply about the significance” of the resources available at the contributing institutions (they are listed in the creators and audience section of this paper). • To provide teachers and students with appropriate material (i.e. tutorials and lesson plans) that will help them research the collection and interpret the resources found in the digital archive. • To provide a discussion forum to encourage public dialogue about ethnic histories. The goals of the project are really clearly explained on the “About the Project” page of the website (http://www.vancouver.wsu.edu/crbeha/projteam/). This page summarizes the background and focus of the project, defines “ethnicity” (the main subject of the digital archive) and the choices the project directors made to feature the history of recent migrants, the layout of the website, and the contact information of the project directors. Harvard’s immigration archive compiles a wide range of materials and includes approximately “1,800 books and pamphlets, 9,000 photographs, 200 maps, and 13,000 pages from manuscript and archival collections.” When searching through the collection, I found resources from individual’s personal papers and from pro and anti immigration organizations varying from settlement houses and children’s aid societies to the Immigration Restriction League. As I searched through the site, I found a diverse range of sources such as maps, photographs, government records, and resources with quantitative data. The scope of the CRBEHA project is never clearly defined. Unlike the Harvard website, which gives numbers of each type of resource it provides, this digital archive does not provide a quantitative overview of its materials. Perhaps it is because each repository is hoping to expand their collections of primary sources about ethnic groups and recent migrants. The range of material lies mostly in the diversity of ethnic groups that the archive covers (African Americans, German Americans, Jewish Americans, Native Americans, Basque Americans, Italian Americans, Chinese Americans, Japanese Americans, Russian Americans, and other ethnic groups. Based on the searching capabilities (which I will describe later in the paper) under the “Browse Archive” page, I can discern that the digital archive includes text-based documents, photographs, oral histories, ephemera, artifacts, and video. The materials range from 1860-the present and cover various subjects such as unemployment, children, families, civil rights, women, organizations, pioneers, race relations, and religious communities. The materials are certainly diverse. 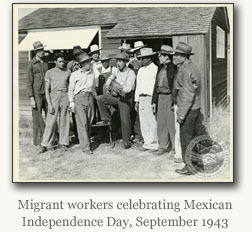 For instance, when searching for textual resources about or written by Mexican Americans, I found a variety of documents which included an analysis of migrant housing, naturalization papers, newspaper articles, minutes from meetings on migrant affairs, migrant farmers labor contractors act, interviews with Mexican Americans, information regarding the entry of Mexican agricultural workers to the US, and many others. ImmigrationArchive.com has over 50,000 historical newspaper pages. However, the website does not list the inventory of newspapers that are queried when website users search the archive. The website should specify the newspapers that are included in the database so researchers can know what ground they covered as they continue to track down sources. All of the material provided by the site is of course newspapers, however, the homepage specifies that the website covers a range of topics that tell “stories of hope and determination” or about “fears surrounding immigration.” Since the topic of immigration is naturally broad and diverse, this is not surprising. The intended audience is perhaps where these sites differ the most. Based on the structure of these websites and the kind of added value they offer, it is evident that the Harvard archive was designed to serve scholars at the college and graduate level, while CRBEHA is geared more to teachers and middle and high school students. The immigration newspaper archive was created for a broader audience, and is not as carefully designed to serve the needs of specific groups. As stated earlier, the creators of OCP and this specific archive about immigration are from various repositories (libraries and Museums) at Harvard. The digital archive was created through “collaboration with Harvard's distinguished faculty, librarians, and curators” (http://ocp.hul.harvard.edu/). The panel on the left side of the website lists the collection contributors (the libraries and museums, the faculty involved, the content committee, the bibliographic and production staff, the imaging services, the cataloging, citation, and permissions group, etc…) at http://ocp.hul.harvard.edu/immigration/libraries.html. The OCP was able to acquire funds for their OCP archive on immigration from the William and Flora Hewlett Foundation. The audience for the website are students and teachers worldwide. It seems as though the website would be most appropriate for students at the college or graduate level who already know a basic history of immigration. Although the website provides some contextual information about topics such as the “Chinese Exclusion Act” or the “Settlement House Movement,” there is no overarching historical overview of this vast topic (immigration) that would help younger audiences engage with the materials and understand the topics listed (i.e. Assimilation or immigrant organizations) in the browsing option. The timeline that has links to various documents in the collection is the only added value that covers the entire subject of the archive (http://ocp.hul.harvard.edu/immigration/dates.html). The CRBEHA project was spearheaded by a professor and Director of Information Services at Washington State University Vancouver. The five participating repositories include Washington State University Vancouver, the Idaho State Historical Society, Oregon Historical Society, Washington State Historical Society, and Washington State University Pullman, and the project was funded by a grant from the Institute for Museum and Library Services (http://www.vancouver.wsu.edu/crbeha/projteam/index.htm). The website provides a list of “partners” and individuals involved in the project at http://www.vancouver.wsu.edu/crbeha/projteam/partners.htm and http://www.vancouver.wsu.edu/crbeha/projteam/team.htm. ImmigrationArchive.com is run by NewspaperARCHIVE.com, which is owned by Heritage Microfilm (which works primarily with the preservation of US newspapers). The audience of the site is specified in the “frequently asked questions” section, which states that “The staff of NewspaperARCHIVE.com has put together this collection of newspapers to benefit everyone from professional researchers to casual history enthusiasts.” The website does provide added value that will be of use to the average user, such as a timeline and an overarching summary of some of the push and pull factors and the quotas that explain the waves of immigration in US history. Harvard has done remarkable work in their digitization and treatment of their documents, and it sets the bar high for the other websites. CRBEHA has certainly adhered to archival standards when digitizing the collection, but this site does not provide the user with quite as many options for exploring the digitalized sources, particularly with written documents, as Harvard’s site. The immigration newspaper archive does not provide adequate metadata for their documents and the resolution of their scanned documents is not as high as the other two websites. Harvard’s immigration archive is very successful in their treatment of documents. The quality of the digital image of the documents and photographs are excellent because they have been scanned at a high resolution. Harvard uses the Digital Repository Service (DRS), which is both a “preservation and an access repository.” Through DRS, Harvard is able to use Page Delivery Service (PDS), which allows them to “deliver to a web browser scanned images” from books and other text-based sources (http://hul.harvard.edu/ois/systems/drs/pds.html). Users can zoom in, rotate, and adjust the size of the document, and they are often provided with a full-text keyword search option. Search terms will be sorted by relevance, by date, or alphabetically. Transcribed versions of the text are often available to users (although not all documents have been transcribed. Users can also convert the page into a PDF file for printing and are provided with “related links” and copyright information for the document. See example, http://pds.lib.harvard.edu/pds/view/3232061?n=1&imagesize=1200&jp2Res=0.5. PDS uses OCR to convert the files into plaintext documents. PDS creates XML files “that contains descriptive metadata about the original source material that is used for the display labels in PDS and to maintain a permanent connection between the digital object and the original source material.” (http://hul.harvard.edu/ois/systems/drs/pds.html). When viewing photographs, users have similar options. They can zoom in (and can select the particular area where they want to look closer), rotate, and adjust the size of the document, and are provided with copyright information. (Please see example: http://ids.lib.harvard.edu/ids/view/3954962?buttons=Y). They can also see “the full record” to view the accompanying metadata for the photograph which seems to follow Dublin core standards. The digitization of the documents in CRBEHA is well done. All of the source material has been scanned at a high resolution. (For example, see http://kaga.wsulibs.wsu.edu/cdm-imls_2/item_viewer.php?CISOROOT=/wsuvan1&CISOPTR=1633&CISOBOX=1&REC=19). Similar to Harvard’s site, website users can zoom in, rotate, and adjust the size of the images and documents. CRBEHA meets archival standards by following the Dublin Core model in the accompanying metadata for the sources. For instance, they provide the title, description, date, subject, type, coverage, collection source, identifier, repository, contributors, project identifier, physical description, format, and rights. I think it would be helpful if the website gave information about how the participating libraries and museums digitized their collections. The documents on this website are not treated with the same care that the other two websites gave to their collections. They are not scanned at as high of a resolution and they are scanned in black and white. Users are able to zoom in on the document as a whole but cannot narrow in on specific parts like the other websites. Unfortunately to view a document, users have to download the article. If the researcher intends to browse through many articles, this becomes burdensome. The metadata provided with each document is minimal. Users are given the name of the newspaper, the location of the paper, the date the article was printed on, and the page number. Harvard’s and CRBEHA’s websites have created various groupings to make their vast collections more approachable and easier to sort through. Unlike Harvard, CRBEHA catalogs a great deal of their material according to ethnic background, whereas Harvard has created more subject fields to categorize items in their collection. In addition to the browsing options offered by these two websites, they both provide users with the option to do keyword searches. However, CRBEHA only searches the metadata for each document rather than searching the full text in the documents. The immigration newspaper archive, on the other hand, only searches the archive according to keywords and date, and could improve vastly by creating further ways for users to narrow down and sort the results from their searches. The search capabilities of Harvard’s immigration archive are excellent. They offer many approaches to “search” and “browse” the collection. The search page (http://ocp.hul.harvard.edu/immigration/search.html) offers two options. Users are provided with two search boxes to search through Harvard’s books, manuscripts, and images digitized by OCP. They can narrow down the results through selecting “title,” “name/creator,” “subject,” and “form/genre” and can also sort the results according to date and document type (textual or visual). The second option on the search page allows viewers to enter in a “search phrase” to find results in transcribed text and digitized books in the collection. It is important the website notifies the viewers about the limitations of the search options, which in this case means that some handwritten manuscripts have not been transcribed and is therefore not searchable. Users can also find relevant materials through searching on HOLLIS (Harvard Online Library Information System) or VIA (Visual Information Access) catalogs. The archive provides many ways to browse the collection that should make it easier for users to find relevant materials. (http://ocp.hul.harvard.edu/immigration/browse.html) Users can browse the collection by genre (books and pamphlets, manuscripts, and photographs) or by subject (topics, themes, people, organizations, and timeline). The books and pamphlets can be sorted by title, author, or date; the manuscripts are separated by personal and institutional records; and the photographs are from the Social Museum (now housed at the Fogg Art Museum) and the Children’s Aid Society, Italian House, New York Collection. When browsing the collection by topic, users have many options, such as “assimilation,” “anti-immigration attitudes,” “education,” “type of work,” etc… There are 9 options for browsing the collection by theme (i.e. Gold Rush, Immigration Press, Scandinavian Immigration). It is evident that the archive developed these “themes” based on the specific subject matter in which they had enough relevant materials. There are 10 options for browsing the collection according to people (such as Jacob Riis, Jane Addams and others), and 5 featured organizations whose materials are available. Unlike the Columbia River Basin Ethnic History Archive that organizes its materials according to ethnic groups, Harvard’s immigration archive catalogs its materials by topic which covers experiences that are apply to all immigrant groups such as “assimilation,” “anti-immigration attitudes,” “education,” “type of work,” etc… However, by grouping sources in this way, the website producers ignore how these immigrant experiences may vary according to ethnic background, or they leave it up to the researchers to make these distinctions for themselves. The only time the website mentions the inclusion of a specific group is when they state that they include “vital materials on the African diaspora,” a group that is usually ignored in the history of immigration in the US. Website users can also browse the collection by historical society (there are 5 repositories that contributed to the online collection); by material type (which I listed in the range of material section); by decade (from 1860-the present); or by subject (which I listed in the range of material section). It is also possible to combine two options so that users can select an ethnic group and one of the other criteria for their search (historical society, material type, date or subject). Unlike the Harvard website, users cannot search the actual content in the documents. There is a keyword search box on the “Browse Archive” page that searches the metadata of all the sources. When the results appear, it is most likely that the researcher can find the keyword in either the title, subject or description of the document. The search options provided by this website are very minimal and should be improved so users can narrow down their results. The user is provided with four search boxes where they can enter in a phrase (either under “all of the words,” “exact phrase,” “one of the words,” or “without the words.” Users can also select what dates they want to search for articles in. They can select “all dates,” “exact date,” or “between years.” (See http://www.immigrationarchive.com/AdvancedSearch.aspx). I think it would be helpful if users were given more options so they could search according to place or region and type of newspaper (i.e. National or local). One major problem with the site is that users cannot prioritize their results. For instance, when I typed in “restriction” in dates 1923-1930, there were 15,637 results and the first 10 results that appeared were all from newspapers in Missouri. (See http://www.immigrationarchive.com/SearchResults.aspx). If I typed in “restriction and New York” in the search box in an attempt to find results from newspapers in New York, my first 10 results are still from Missouri newspapers. Harvard’s site provides adequate information about its goals and the construction of the digital archive. The website offers a large range of historical resources and groups them in many ways so that researchers can most easily find relevant materials. The site also has excellent searching options, and the treatment of the documents and their accompanying metadata is outstanding. Although the creators of the website seem to avoid categorizing materials according to ethnic backgrounds, I think this should be a consideration for the website since immigrant experiences (concerning assimilation, education, labor, etc) are so dependent on their countries of origin. Perhaps Harvard did not have enough materials on the various ethnic groups to flesh this out? This website is very straightforward in its overall mission and provides excellent materials (archival resources and supporting historical overviews and lesson plans) for its intended audience. The creators seemed to put a lot of thought into how the materials could be used, which in turn increases the dissemination of the materials. I think using the digital media to combine the collections from 5 different repositories is exciting and perhaps more institutions will begin to follow this model and bring together their resources to tell larger stories. The website does not provide information about their process for digitizing their collections, and it did not explain the selection process and how specific records were chosen for this project. Also, I think the website’s search options could be improved so that users could combine all the different fields in their searches. For instance, they could look up records about Italian Americans according to both material type and date (rather than picking one or the other). The website also needs to fix its discussion board link, which at the moment is not available. Since this website functions mostly as a database that queries vast amounts of newspaper articles, the search options were too minimal for allowing users to find relevant and useful sources. Furthermore, this site barely described the scope of its archive and how it was created. While I believe that the goals of the site are strong and well defined, the services that it actually provides to users are unsubstantial.